As I mentioned more than once my main (in a limited scope I need it) office suite at home is OpenOffice. It handles things like budget spreadsheet just fine but still lacks in Microsoft Office compatibility department. Especially when opening and searching large files. 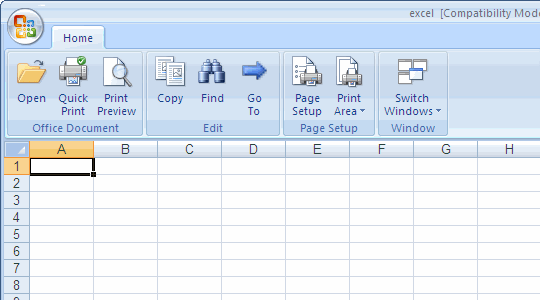 I remembered that Microsoft actually offers free viewer software for Office formats and decided to try Excel Viewer. App is essentially extremely limited version of Excel 2007. It allows to view, search and print spreadsheets, but not to modify them. Interface is regular Office ribbon with those few functions that are allowed. Viewer comes as standalone download (quite large at ~75MB) and is available in multiply languages (probably as many as Office itself). Native performance is also nothing to sneeze at – it works with large files much faster than third party editors. For some files Excel Viewer is not simply limited, but too limited. One of the price lists I commonly work with has scripted navigation in form of folding tree with categories. Well, Viewer completely ignores nodes and makes navigation useless. So it depends on files you need opened, but for more complex there was obviously too much cut from Viewer. It would make sense to have suite of viewers, but Excel, Word and PowerPoint ones all come separately. Minor issue, but might matter if you need to deploy a lot of these. Native viewer has major performance advantages for proprietary Office formats, but its functionality was limited to almost nothing. Experience highly depends on complexity of files you need to open. Microsoft has actually had these for some time and don’t really advertise them. I suppose since they make so much money off their office suite they try and downplay it.